Stained-glass composition by J. Le Breton (glass studio of Gaudin, Paris), 1933. Le Breton, Jacques ; Gaudin, Jean. 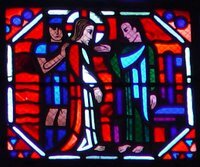 Jesus Before Pilate, from Art in the Christian Tradition, a project of the Vanderbilt Divinity Library, Nashville, TN. http://diglib.library.vanderbilt.edu/act-imagelink.pl?RC=51569 [retrieved April 20, 2019]. Original source: Collection of Anne Richardson Womack. Amiens: Les Verrieres de la Cathedrale. Frachon-Gielarek, Nathalie. Inventaire general des monuments et des richesses artistiques de la France, 2003.